Long before that girl from Kansas arrives in Munchkinland, two girls meet in the land of Oz. One – born with emerald green skin – is smart, fiery and misunderstood. The other is beautiful, ambitious and very popular. 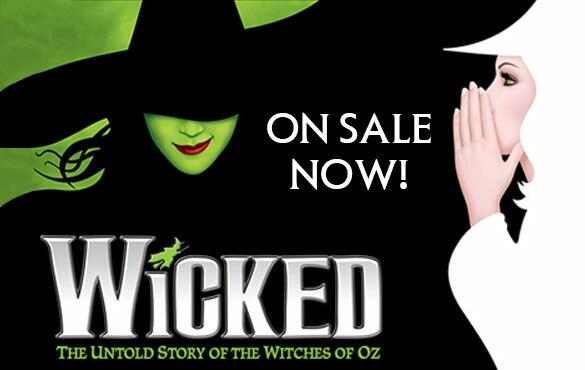 How these two grow to become the Wicked Witch of the West and Glinda the Good makes for “the most complete – and completely satisfying – musical in a long time.” (USA Today) Click here for tickets and seating information. Although the actors will be performing at DPAC a total of twenty-four times, some shows only have a few tickets left. 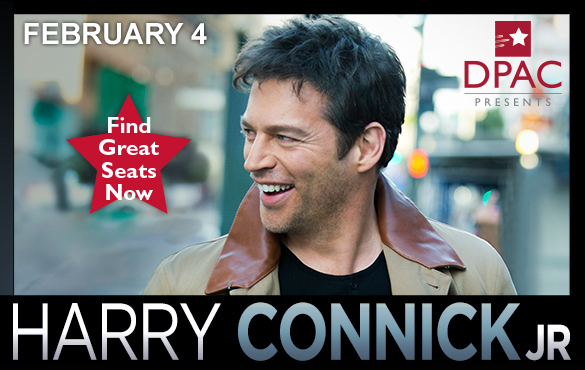 Harry Connick, Jr.’s meteoric rise in the world of music was only a prelude to a multi-faceted career. This pianist, vocalist, composer, band leader, actor and philanthropist has received awards and recognition for his live and recorded musical performances, and for his achievements on screens large and small, as well as the Broadway stage. Back by popular demand, get tickets to hear his only performance at the Durham Performing Arts Center on February 4 at 7 pm. Throughout his career, Harry Connick, Jr. has earned three Grammy® Awards, two Emmy® Awards, and two Tony® nominations, and he spearheaded efforts to help rebuild his hometown of New Orleans after the devastation of Hurricane Katrina. Below is a YouTube video of him performing on the piano and singing “For Once In My Life” and he is accompanied by a talented jazz ensemble. 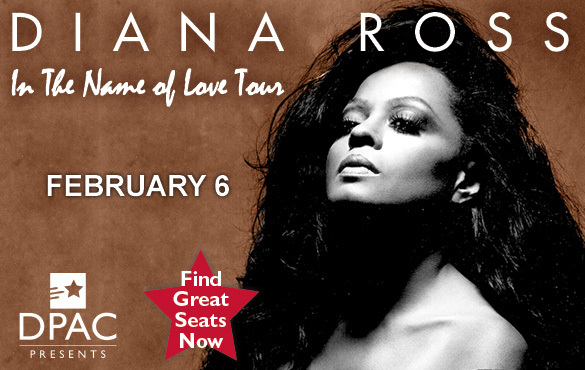 On February 6, at the Durham Performing Arts Center, Diana Ross will be performing in concert from the “In the Name of Love Tour.” Diana is one of the world’s greatest entertainers of all time. Legendary singer, artist, and actress Diana Ross is one of the most iconic female singers in the world. Ms. Ross’ last performance at DPAC in March of 2011 was sold out. Be sure to book your tickets soon! The icon is forever cemented in history with two stars on the Hollywood Walk of Fame. “Stop! In The Name of Love,” “Where Did Our Love Go” and “You Keep Me Hangin’ On” have all been inducted into the National Academy of Recording Arts and Sciences Hall of Fame. “Stop! In The Name of Love” and “You Can’t Hurry Love” are among The Rock & Roll Hall of Fame’s Songs that Shaped Rock and Roll. Beginning in the ’60s as lead singer of the world-renowned group The Supremes, Ross and the group achieved the unprecedented feat of 12 number-one singles in the U.S., becoming the most successful American group in history and rivaled only by The Beatles for the position of the biggest hit group of that generation. Diana Ross went on to achieve 6 number-one single as a solo artist, amassing a total of 18 #1s. When “Endless Love” hit Number One in 1981, Ross became the first female artist in music history to place six singles at the top of the Billboard Hot 100 chart. “Endless Love,” sung with Lionel Ritchie, remains one of the most successful duets in pop history. Below is Diana Ross’ Christmas performance in Washington a couple years ago. Diana Ross’ musical repertoire encompasses rhythm and blues, soul, pop, disco and jazz. Diana Ross helped shape the sound of popular music, changing the landscape and paving the way for contemporary music. She has fans all across the world. 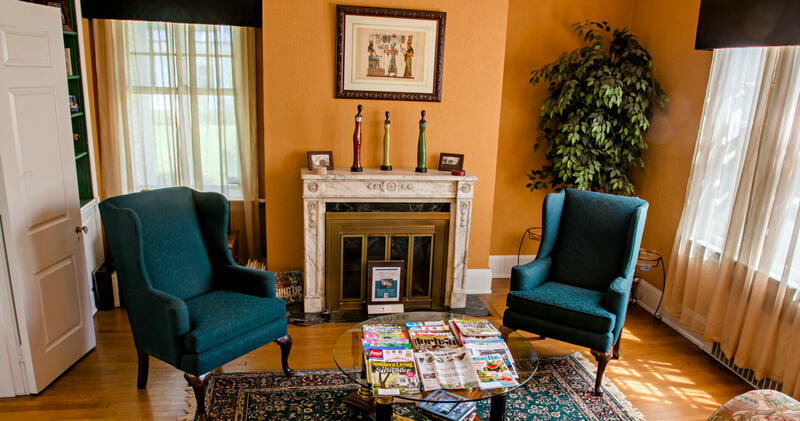 Don’t miss this one night to see her perform live in Durham, North Carolina within walking distance from our Morehead Manor Bed and Breakfast. This entry was posted in Uncategorized and tagged Christmas, Diana Ross, Durham Performing Arts Center, Harry Connick, jazz, Jr., Morehead Manor Bed & Breakfast, music, New Year, Theatre, Wicked, WItches of Oz by admin. Bookmark the permalink.